December 2011 was a busy time in the calendar for our parish Brass Band, with their first festive performance held on the 8th of December, followed by a number of performance throughout the area which included Freeport, Asda and many of the local villages. Biddulph Asda was the venue on Saturday 17th December where they entertained the shoppers with Christmas music. Saturday evening brought the band back to our village where they held their Christmas Concert in the Audley Theatre. The Band led by musical director Ian Turner, who celebrated his first year as director brought a festive theme to a packed house. An appreciative audience helped to make it a memorable night, as they joined in with many of the popular carols being played. During the night’s performance the audience was also privileged to enjoy solo performances by Paul Ryder who played (Soloist-Soprano Cornet), Mark Woodvine (Soloist-Euphonium) and Peter Moxon (Soloist-tenor Horn)- three excellent musicians from our village band. A musical version of the Millitary Wives song writen by Ian Turner, was also performed at the concert and on the following Monday morning on the Chris Evans radio show, the Audley Brass Band musical version of the song was played and it was accompanied by three choirs. The concert night at the Audley Theatre, kick-started the Christmas theme for everyone who attended, a night to remember and a night not to be missed in the future. 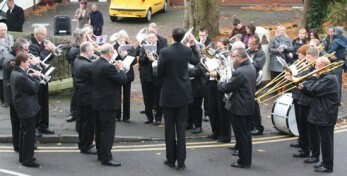 The band continued with its Christmas festive theme the day after the concert, when despite the awful weather conditions they toured the Bignall End area busking during the morning, then on through the Audley village in the afternoon. Their final event for the year was held at the Wychwood Golf Club Crewe where they entertained a very appreciative audience of members. for up and coming new or returning members to show their skills. There are opportunities for any budding musician to come along and try out an instrument, which will be supplied. Why not give it a try, they are always on the look out for more local talent. Practice night is held at the new Band Hall in Dean Hollow Audley, on each Thursday night. For any more information please contact the group secretary: Alison Gidman on 01270 876000.